In 2002, Danish electronic percussion duo Safri Duo covered the song featuring Michael McDonald. It was released in June as the fourth and final single from their debut album, Episode II. ↑ "Songfacts.". songfacts.com. Retrieved 2009-01-09. ↑ "Austriancharts.at – Safri Duo feat. Michael McDonald – Sweet Freedom" (in German). Ö3 Austria Top 40. ↑ "Ultratop.be – Safri Duo feat. Michael McDonald – Sweet Freedom" (in Dutch). Ultratop 50. ↑ "Ultratop.be – Safri Duo feat. Michael McDonald – Sweet Freedom" (in French). Ultratip. ↑ "Musicline.de – Safri Duo feat. Michael McDonald Single-Chartverfolgung" (in German). Media Control Charts. PhonoNet GmbH. ↑ "Italiancharts.com – Safri Duo feat. Michael McDonald – Sweet Freedom". Top Digital Download. ↑ "Nederlandse Top 40 – Safri Duo feat. Michael McDonald search results" (in Dutch) Dutch Top 40. ↑ "Archive Chart: 2002-10-05". Scottish Singles Top 40. ↑ "Spanishcharts.com – Safri Duo feat. 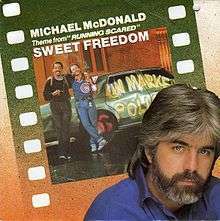 Michael McDonald – Sweet Freedom" Canciones Top 50. ↑ "Swisscharts.com – Safri Duo feat. Michael McDonald – Sweet Freedom". Swiss Singles Chart. ↑ "Archive Chart: 2002-10-05" UK Singles Chart.